Sometimes the easiest way to locate those "hard to find" places is with a map. Hope this helps. WELCOME - Welcome to the world of the birchbark canoe. Newsletter Subscription - Sign up for our bi-monthly newsletter. ABOUT US - Who we are and our vision. CANOES - Styles, types and pricing. Birchbark Canoes - A portfolio of some of John Lindman's canoes. Consignment Canoes - Used canoes. 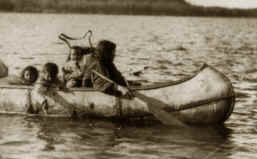 Fiberglass Replica Canoes - Canoes that replicate genuine birchbark but in fiberglass. Proto Types - Some shots of the different styles we have on hand. Ottawa - The Ottawa Model. Abenaki - The Abenaki Model. Ojibwe Longnose - The Ojibwe Longnose Model. Scale Model Miniatures - Museum quality scale miniatures birchbark canoes. Group Class - Learn to build a full size birchbark canoe with other students. Advanced Class - Build your own birchbark canoe - you get to keep it! Private Class - Set up your own class and we come and deliver it - to one person or a group. Home Study Class - Home study kit allows you to learn to build at home. ACCESSORIES - Paddles, pack baskets, crooked knive, etc. TIPS - Technical tips on how to make birchbark canoes. BOOKS - Books on birchbark canoes, the fur trade and more. LINKS - External Links to other great sites that relate to birchbark canoes. FURNISHINGS - Rustic furnishings for cabin and lodge. NEWS - Where you can find birchbark canoes displayed, past newsletters, etc.